Come spend Winter Break with Impact at our Winter Break Camps. Extended care available by request. WHAT WOULD YOU DO WITH 4 HOURS??? Come to Impact and drop the kiddos off for a flipping fun time while you have 4 hours to yourself!! We will be decorating cookies, running obstacle courses, playing games and watching Elf. You won't want to miss this exciting event. Come visit with Santa at Impact! Grab a cookie, some hot cocoa and listen to our wonderful Caroling Coaches as you get your picture taken with Santa. This is a FREE event open to the public! Need time for holiday shopping?? We have you covered! Drop your kiddos off at Impact for our Under the Sea themed Day while you start/finish your holiday shopping. Sunday, December 9, 2018 from 10:00 am - 2:00 pm. Pizza, Under the Sea games, obstacle courses, and open gym! Don't miss our on this UNDER THE SEA event!! Need time for holiday shopping?? We have you covered! Drop your kiddos off at Impact for our Superhero themed Day while you start/finish your holiday shopping. Sunday, November 25, 2018 from 10:00 am - 2:00 pm. Pizza, Superhero games, obstacle courses, and open gym! Don't miss our on this SUPERHERO event!! Dress up in your Halloween costume or your favorite holiday attire and join us for games, pizza, costume contests , open gym and more! Kids ages 4-17 years old welcome to join the fun! Wear your Halloween costume to gym! Make sure you can do gymnastics in it!! 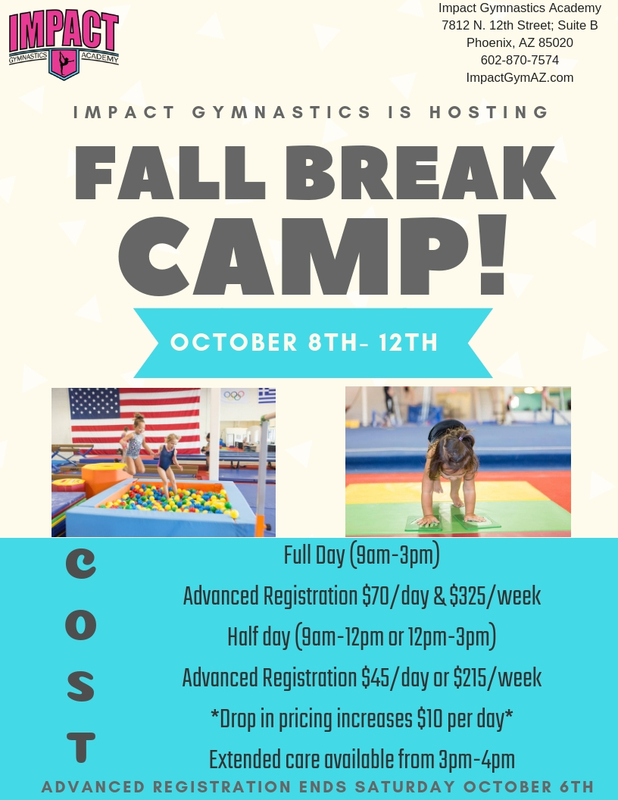 Join us for a flipping fun time at Fall Break Camp! Coffee and donuts every Saturday!! All proceeds help the Impact Girl's Gymnastics Team travel fund! #makeanimpact!! Come Flip for a good Cause on Saturday, September 1, 2018, from 5-7 pm. $10 cash at the door. 100% of the proceeds will go to Bridget and her family for medical bills. Bridget is battling cancer and lost her leg to this horrible disease but HAS NOT LOST HER SPIRIT!! Make and impact on her life and FLIP FOR A CAUSE!! Come to Impact and drop the kiddos off for a flipping fun time while you have 4 hours to yourself!! We feed them, play with them and tire them out! You won't want to miss this exciting event. Come join the Impact Girl's Team at Chipotle Restaurant at Paradise Valley Mall for a great meal and lots of fun. All proceeds will go towards the travel fees so the team can compete in Atlanta, Georgia in the Spring at the Atlanta Centennial Classic. Bring your unwanted items and drop them off at Impact anytime until August 11, 2018 and receive a FREE OPEN GYM pass for every large bag of items you donate. In ding so, you will be helping the Impact Girl's Gymnastics Team raise money for their travel competitions. It's a WIN - WIN!! You get to declutter and the team gets to offset travel costs!